Public Narrative is a leadership art that draws on the power of storytelling to motivate others to join us in taking action. Each of us can learn to tell a story that moves others to action, and then people and communities leading transformation efforts can use such stories to draw out emotions, build alignment, and motivate stakeholders. Public Narrative provides a way of thinking through the stories that mobilize people for collective action. 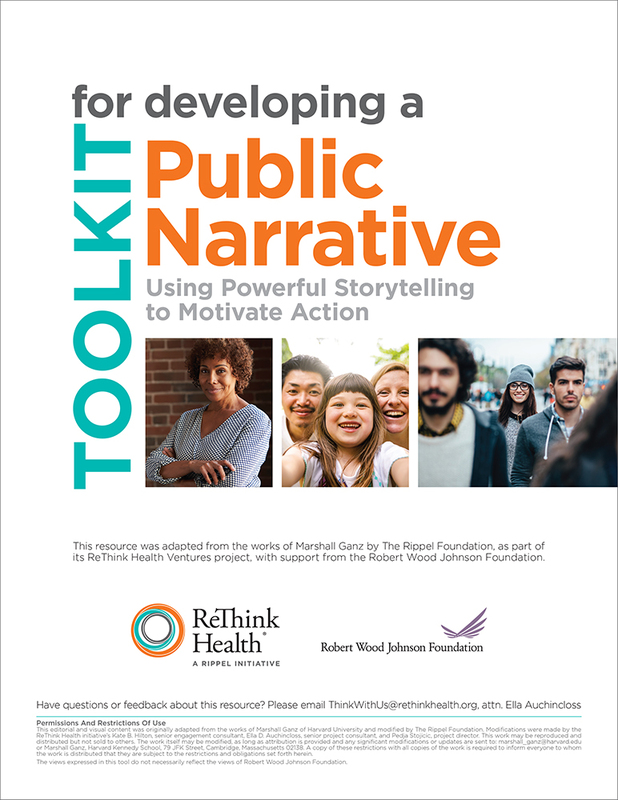 This Public Narrative Toolkit was designed for the leaders and stakeholders involved with regional collaborative efforts, such as multisector partnerships, that are working to enable health system transformation, effectiveness, and sustainability. It will support all who are interested in harnessing the power of storytelling to motivate others to join them in action, guiding them through the development of a Public Narrative that brings together three different types of stories: a Story of Self, a Story of Us, and a Story of Now. This toolkit includes short videos, worksheets, workshop agendas, and coaching tips.